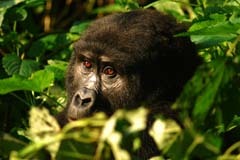 There are 3 areas in Bwindi Impenetrable Forest from where you can track gorillas: Buhoma, Ruhija and Rushaga/Nkuringo. Each area has 3 (Buhoma) ,2 (Ruhija) and 6 (Rushaga) gorilla families whom can be visited once a day by a maximum of 8 people. You can also trek in Mgahinga National Park where there is 1 habituated family group. Permits can sell out on certain days, especially in the high-season. On certain occasions we may have to plan your trip around when and where we can find availability for permits. 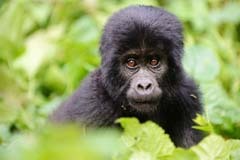 A gorilla trek starts at 8am in the morning with a safety briefing from the Uganda Wildlife Authority. A trek can last anywhere from a few hours to a full day. These animals are 100% wild and while territorial, can cover vast distances in one day. Once you have found the gorillas you will be with them for one hour. This time limit is to respect their existence as wild animals, not over-exposing them to humans. There is a safety distance of 8 metres that you must remain from the gorillas. This is not only for your safety from a creature exponentially stronger than yourself, but also for the gorillas whom are susceptible to some human diseases such as the flu. You may have seen internet videos of people much closer than this. On rare occasions a gorilla may move very close to you, this is their choice as a wild animal but you should not expect this nor make the approach yourself. A sighting is not guaranteed however daily success rates are very high. All lodges in the area provide their clients with a packed lunch. You will travel with at least one guide and one ranger from the Wildlife Authority. You will be asked if you would like a “porter” to carry your bags and help you up the mountain. We encourage you to take this offer. Not only can the terrain be steep and the jungle dense, but it is one of the key ways that gorilla trekking supports the local community. Porters are organised and scheduled by their own association and have a standardised fee. You are trekking in the jungle. You must have sturdy boots or shoes, long pants and preferably a long sleeved top. A light rainjacket is essential as rains can come sporadically through-out the day. A small ruck-sack/day pack will come in handy to carry your extra clothes, lunch, camera etc.. 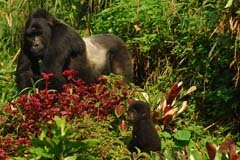 There is a minimum trekking age for Mountain Gorillas in Uganda of 15 years which is not negotiable. It is however still possible to travel with children to Bwindi as there are a range of other rewarding, child-friendly activities that we can organise whilst you are trekking. There are 3 areas in Uganda from where you can track Chimpanzees: Kibale Forest, Kyambura Gorge (near Queen Elizabeth) and Budongo Forest (in Murchison Falls). Kibale is by far the most popular and chances of a sighting are high. In Budongo and Kyambura, sighting chances are not quite as high, although one feels a greater sense of achievement when you finally track down the chimpanzees from their knuckle-tracks and calls in the forest. While gorillas stay in defined family groups, chimpanzees live in a community of around 100 chimps (depending on where you are trekking). Chimpanzees live in a social kaleidoscope, a community will be split into any number of groups through-out the day. You may first see a group of 4 that could join with a group of 20 as they encounter others. You may be lucky enough to see multiple groups on one trek. Chimpanzees are very active and often very vocal. You can be treated to a range of behaviours from eating, to mating, to fighting to playing to grooming. A troop of chimpanzees hooting in the forest and/or drumming on tree buttresses is a sight to see and hear! Like gorillas there is an 8 metre safety distance, even more so important with chimpanzees whom are our genetically closest relatives and extremely susceptible to human diseases. You may not be allowed to trek if you feel unwell. Terrain is mostly flat (a bit more challenging in Kyambura Gorge) and paths generally well maintained. You will likely go off-path with your guide once you have located the chimpanzees. 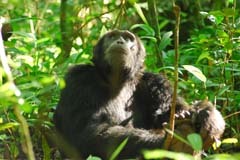 Once you have found the chimpanzees you will spend one hour with them, this respects their existence as wild animals. 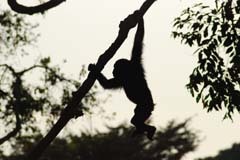 Chimpanzee Habituation – Chimpanzees are habituated on a daily basis by rangers and researchers. Habituation in simple terms means humans spending time in the vicinity of wild chimpanzees to slowly let them become used to our presence and not see us as a threat. This process takes years before a group can be safely and successfully viewed by tourists. You can book a spot on these daily habituation activities (limited to 1 or 2 people), accompanying the rangers for a full day in the forest. This is a fantastic excursion for those with a particular interest in primates. More in-depth than a 1-hour viewing, you’ll get a true insight into daily chimp life by monitoring them through-out the day. The rangers and researchers you’ll accompany will share their stories of life in the forest and their interesting observations of chimpanzee behaviour. Gorilla Habituation – Quite recently the Ugandan Wildlife Authority have made it possible for a selected number of tourists to assist in the habituation of a gorilla family. This very special experience has never been offered before in Uganda and must be one of the ultimate encounters for any primate enthusiast. The gorilla group in question is in the process of habituation, hence a little shyer than a regular group. You will be a part of the process that prepares this family to be safely viewed by tourists which ultimately contributes to their survival as a species.These will truly be the wildest gorillas that you’ll ever witness in the jungle environment. 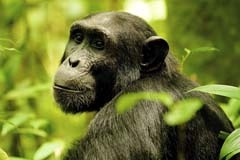 Chimpanzee Encounters – In Entebbe both the Ngamba Island Chimpanzee Sanctuary and the Uganda Wildlife Education Centre offer programs for you to spend time and physically interact with rescued and rehabilitated chimpanzees. This is a very rare and special experience, as a young chimpanzee takes your hand in the same way a small child would. If you are interested in this, please do ask us about it in advance as there are strict health and vaccination requirements that take some time to certify and complete.